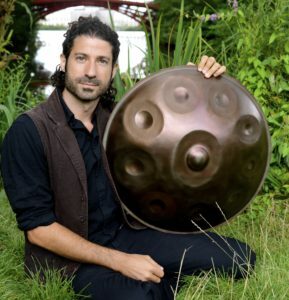 Naftali is a multi-instrumentalist and hypnotherapist whose passion for creating trance-formative states of connection bridges the worlds of music, movement and healing. After abandoning a career in Theology in his hometown of Jerusalem, Naftali moved to the U.S. and attended Columbia University, where he gained degrees in Philosophy and Comparative Literature. While living in New York, he went on to study Method Acting as well as Movement and Somatic practices. Inspired by the deep potential for change and healing that he experienced there, Naftali continued to explore alternative modalities for increasing awareness and psycho-spiritual insight --including Core Shamanism, Tibetan Buddhism, Hypnotherapy, Generative Coaching and Non-Violent Communication. He is passionate about opening spaces in which people can reconnect with their natural aliveness, spontaneity and authentic presence. In addition to organizing live sound journeys, conscious dance events and ritual gatherings, Naftali offers therapeutic workshops and individual sessions in Hypnotherapy, Embodied NVC, Conscious Movement and Authentic Self-Expression. He is the founder of MediTANZion - a conscious dance journey that takes place every two weeks in Berlin. MediTANZion is an open space for free-form dance and inner journeying through movement, music and stillness. Dance is one of the oldest and most profound human technologies of connection (allowing deeper access to different parts of the self, the group, the cosmos). It is a powerful tool for reconnecting, healing, releasing, moving energies and emotions, or as a form of embodied prayer. MediTANZion is an event that honours the sacredness of the human body and its relation to music and movement and opens a space in which people feel safe and free enough to surrender - dropping out of the learned limitations of the mind and letting the body take over.